A wonderful cake! It seems that Silas loved it ;-P! Awww,... there's the handsome boy! 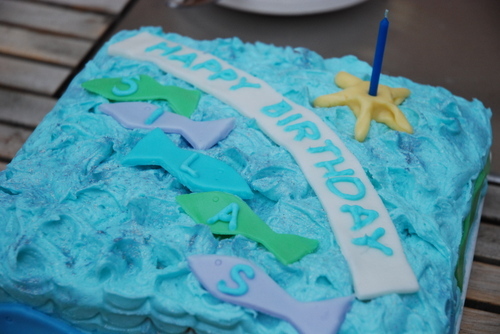 Love the blue icing, too. What a beautiful cake! I'm so glad your son had a wonderful birthday. LOVE the photo of the birthday boy. Well Mom, it looks like that cake was DEFINITELY well appreciated. wow a year old already! Time ticks by so fast. The cake looks so cute. So wonderful to see what you made and the joy it brought. Cheers to you. Aww hes so cute! Yummy looking cake as well! i made some LUXURIOUS grits the other day (instead of using water, i used 50% water & 50% heavy cream!!) and thought of u! Has it really been a whole year????? Happy birthday, Silas! Lyn, your cake is lovely. I put off working with fondant for years, but there's a small cake/candy making supplies store near our house, and they make their own. Without gelatin, too...which is in issue of Alex or I are to eat it. 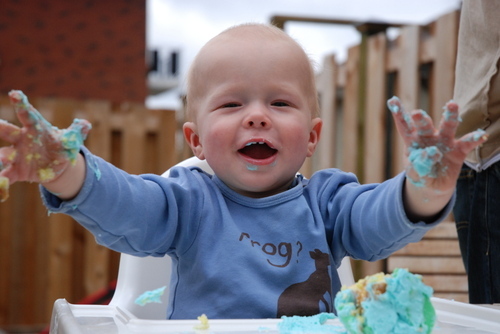 He's adorable, and the cake looks good. You should be proud, on both accounts! I came across your blog while searching for ice cream recipes. I plan on trying your chocolate cinnamon recipe soon.